Susie Isaacs was born in Nashville, Tennessee on December 18, 1946. She first got involved in poker when she was 4, standing guard while her brothers played poker on a monopoly board to camouflage their activities from their parents. Her brothers let her into the game once she could count, and she sold her comic book collection to get into the game. Susie Isaacs moved to Las Vegas in 1986, and started playing poker in some ladies’ poker tournaments for fun while her husband made the money for their family. She enjoyed playing, as it was also a fun social outlet. However, after divorcing her second husband in 1990, Susie Isaacs had to get better if she wanted to continue playing poker to support herself. Susie Isaacs put forth a serious learning effort, and she went from a losing poker player to a breaking even poker player, and then finally became a winning poker player. Susie Isaacs has the distinction of being the only lady to win consecutive titles at the World Series of Poker Ladies’ events, which she did in the 1996 and 1997 World Series of Poker. 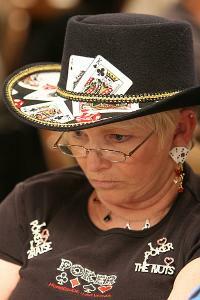 Susie Isaacs is also a very successful poker writer. She writes articles for poker magazines, including CardPlayer, and she has also written two poker books, MsPoker: Up Close & Personal and 1000 Best Poker Strategies and Sectrets. Susie Isaacs has one child and 2 stepchildren.